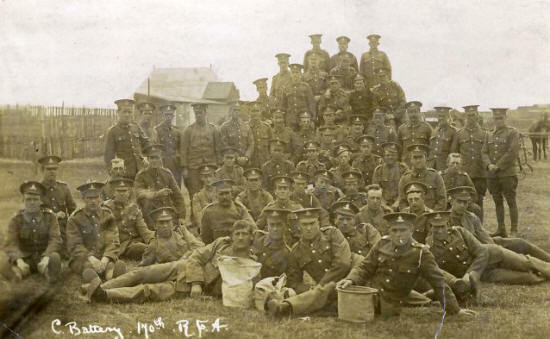 COUNTY PALATINE BRIGADES ROYAL FIELD ARTILLERY. INSPECTION BY SIR W. H. MACKINNON, K.C.B. T he 171st Brigade the latest brigade to be billeted in St. Annes will be removed to Blackpool next week. This means removal of 1,000 men. Lieut.-Cot. Gregory is in command of the 171st Brigade, and Lieut. Gray has been transferred from the 149th to the 171st as adjutant. Adjutant Lieut. Casbolt, is now adjutant to the 149th. The Manchester and Blackburn Brigades have entered upon their last three weeks. They are being drafted to Grantham, Lincolnshire for a brief period, and then to Aldershot. Grantham is on the main line of the Great Northern Railway, and about 24 miles south of Lincoln. It is a municipal borough with over 20,000 inhabitants, and engineering and agriculture are its chief industries. The people of St. Annes will he sorry to lose such well-behaved troops, but the best of friends must part. No effort will be relaxed to entertain our soldier friends right up to the farewell. Soldiers of the Royal Field Artillery in fields off Headroomgate Road, 1915 (Houses in the background are on Highbury Road). The Army had riding schools here. 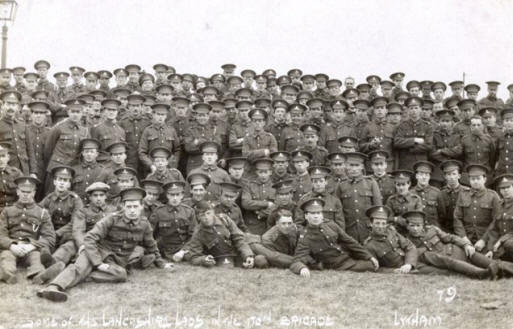 The British soldier stands higher in the estimation of the people of St. Annes since they have had the honour of taking some practical interest in their training and welfare. Many residents have revised their opinions of their khaki defenders since they have rubbed shoulders with them. The 150th Brigade snorts were an unqualified success from several Points of view—perfect weather, big attendance and excellent sport. The intention of the promoters was not to "make money," but to provide a good day's sport; hence some 6,000 free tickets were issued. Generous townspeople at Blackburn and St. Annes came forward and contributed a considerable sum towards the prize money. The full amount has not yet been raised, and it only needs this hint, we feel sure, for the few remaining pounds to be forthcoming. The secretaries (Mr. H. J. Carmont and Mr. J. Bowman), or the treasurer (Mr. Ernest Hamer, J.P.), will be glad to hear from ladies or gentlemen who have not had the opportunity of subscribing to the prize fund. Everybody will sympathise with Lieutenant-Colonel Dixon in the serious accident that befel his beautiful charger "Stella," immediately after the sports. She was being ridden by Lieut.-Adjutant Gray along North Drive, and became unmanageable. Lieut. Gray succeeded in dismounting, unhurt, but the mare attempted to leap a few spiked railings at the corner of Mr. Boddington's garden, and became impaled. Three spikes entered the breast of the horse, tearing the flesh deeply. Assistance came from Wynslade, and the animal received veterinary attention as soon as possible. There are hopes of the mare's recovery. Three capital lectures have been arranged for the troops by Mr. J. Gregory secretary of the Parish Rooms. To-night 'Mr. J. R. Gibbs will show, by lantern views, some of the latest war pictures, and will give a chat on them to the Manchester Brigade. The same lecture will be repeated to-morrow (Saturday evening), for the benefit of the Blackburn Brigade. On Sunday Coun. R. Leigh will speak on "What Italy wants from Austria" and his lecture will be illustrated by lantern views. Each lecture will commence at 8.0 p.m., in the Parish Rooms. The 149th and 150th Brigades were inspected on Wednesday morning by General Sir William Henry MacKinnon, K.C.B., K.C.V.O., commander-in-chief of the Western Division. General MacKinnon was accompanied by his aide-de-camp and Brigadier- General Abdy, and Brigade-Major Webb. The inspection was very brief, and as the public were unaware of the General's visit there were very few spectators. The troops were inspected as they went through their usual daily drill, and General MacKinnon expressed the opinion that they were a splendid stamp of men. He was greatly interested in the ingenious wooden model guns with mechanical contrivances, invented by Lieut. Col. Dixon. Field sports for the 150th (Blackburn) Brigade of the County Palatine Royal Field Artillery were held on the Clifton Park Racecourse on Monday. The event was favoured with brilliant sunshine, and the large attendance had nearly four hours of most enjoyable sports. Most of the events had a humorous side, and whilst the flat racing was proceeding humorous "turns" were fought out. As a result the sports were more interesting and entertaining than is usual with field sports. Pillow-fighting, with the combatants mounted on a large horizontal pole, was the greatest fun, and this kept the crowd amused for an hour. Then there was mop-fighting with the combatants mounted pick-a-back, and mops dipped in flour. Musical chairs for mounted officers was a great success, some of the horses showing a great dislike to being pulled in the rush showing chairs. The boot race and the sack race were also enjoyable novelties, and in the sack race the competitors had the sacks tied round their necks, and they were required to jump over a pole eighteen inches high. The competition for the best gun detachment introduced a serious note, and the smart way in which the gun crews went through their work at the command of Lieut. Emberson was loudly applauded. Lord Derby and General Abdy watched the gun drill, Lord Derby being received with hearty cheers. The judging of the gun drill was done by General Abdy, who also judged the officers' musical chairs. General Abdy said the work was so good that he could not make any distinction between them, and therefore the prizes must he divided. The most keenly-contested events were the tugs of war, of which there were three—one for the 149th, one for the 150th, and an inter-brigade tug-of war. The conditions were a straight pull and no digging in. The inter-battery tug for the 150th was splendidly contested, and amongst the troops there was great excitement. The inter-brigade tug of war was a fairly easy win for D Battery of the 150th, who were thus the champions of the day. All the events for the 150th were inter-battery, an excellent arrangement, each man competing not merely for his own honour, but for that of his battery. As a result there was an additional keenness, each battery wishing to carry off the championship. During the afternoon the band of the 150th played selections of music. At the close the prizes were distributed by Mrs. Abdy, who had at appreciative word for most of the winners. Hearty cheers were given for Mrs. Abdy, Mr. Cotton, Col. Dixon, and General Abdy. Most of the success of the afternoon was due to the great interest displayed by Col. Dixon, the President, Mr. Ernest Hamer J.P., the hon. treasurer, and Messrs. Jas. Bowman and H. J. Carmont, the hon. secretaries, and the officers of the Brigade who worked hard both in deciding heats and on the day. The judges were Ald. S. Crossley, J.P., Mr. Lawrence Cotton, J.P., Cone. C. F. Critchley, C.C., Coun. Hammond, Major H. N. Dixon, Mr. J. W. Carter, Mr. John Eddleston, Mr. W. P. Kay, and Mr. R. Birtwistle, with Mr. F. Middleton as judge's steward. Capt. W. A. Smith was the starter, and the officers of the brigade were the stewards. 100 yards-1, W. H. Cook, A. Battery; 2, H. Place, B Battery; 3 M. Edmondson, Ammunition Column. Tug of war, 149th Brigade—A Battery. Tug of war, 150th Brigade- D. Inter-Brigade Tug of war, 150th Brigade—D. One mile----Marsh, 149th Brigade; 2, McGowan, 149th Brigade • 3, Smith, D. Officers' race—Lieut. J. N. Cotton, B; 2, Lieut. Norman; 3, Lieut. Smith, C.
Boot race—Logan, C; 2, Nightingale, D. 440 yards flat race—Parkinson, A C; 2, Cook, A; 3, Peters, C.
Three-legged race--Haslam and Smith, D; 2, Swarkbrick and Eccles, A; Ridge and Pomfretr B. Barrel race—H. Oldham, C: 2r King, B: 3, Breercliff, C.
Relay race—Ammunition Column ; 2, B Battery; 3, A Battery. Ogden, B: 3, Culligan, B. 2, Lieut. Emberson, C; 3, Lieut. Almond C. Sack race 73:i D; 2, A. Hollis, D; 3, S. Smith, C.
Clowns costume race—W. Whalley, B; 2, V. Geldard, A C; 3, C. Lund, A.
Lieut. J. Gerald Butterfield, the officer commanding "B" Battery, 169th Brigade (County Palatine) R.F.A., has issued a challenge for cross-country running, as follows:—"I should be greatly obliged if you could grant is a paragraph with regard to several of our men who are very good long distance runners. We have at present in "B" Battery a, team of twenty who are the champions of the 169th Brigade, and anxious to add further laurels to those already gained, the "13" Battery ,team wish to meet a team of twenty from any battery, squadron, or company from any brigade or regiment in or around Blackpool. This may seem a bold challenge, but as proof of the prowess of "B" Battery's team I may mention that in an eight miles’ road race run against "A" Battery about ten days ago we placed 16 of our men in the first twenty home, and also had the 1st, 3rd, 4th, 5th, 6th, 7th and 8th men home. Trusting that our challenge may be taken up by some regiment at present stationed in or around Blackpool." The work at the soldiers' institute at the Drive Wesleyan School, has been somewhat interfered with during the last week-end. The military authorities took possession of the school-room for the use of their headquarters. This of course meant that the soldiers could not utilise the room as they had done before. The secretary however was able, through the kindness of the Primitive Methodist friends, to arrange for the use of their schoolroom. The Friday evening concert was accordingly held there and was attended by a large number of soldiers; several of the usual faces were missed, probably owing to the fact of the change of room not being sufficiently known. The following programme was given: Songs, "The Sleeping Camp." Mr. H Warburton; "The merry month of May," Miss Martin; "All that I ask is love," Gunner Carol; "Nirvana," Mr. A. Beswick; "When the ebb tide flows," Mr. H. Warburton ; and "Waltz-song" (from Tom Jones), Miss Martin. There was a cornet solo, by Mr. L. Fielder, "The flight of ages," and a duet, "Watchman, what of the night?" by Miss Martin and Mr. H. Warburton. Prof. Dacre also gave a conjuring turn. Mr. John Watts presided and Mr. and Mrs. T. P. Bentley were the host and hostess, who provided the soldiers with refreshments and cigarettes. A hearty vote of thanks was accorded by the men on the proposition of Mr. A. E. Rawson, to Mr. Watts, Mr. and Mrs. Bentley, the artistes, and the ladies who had looked after the refreshments. Next Friday evening's concert will be held in the Primitive Methodist Schoolroom. On Sunday evening the social service was held in the church. Mr. Bentley played several organ solos, and well-known hymns were very heartily sung, including, "Stand up for Jesus," "Hark, hark my soul," "0, it is hard," "Forward be our watchword," "0 Lord of heaven and earth," and "God of our fathers." -Mr. Bentley also - played "Cavalry March" (Jude), "Songs of melody" and "The war march of the priests." Mrs. Bentley sang the solo, ''Down in the Valley," the soldiers joining in the chorus, and Mrs. Herbert Walker, of Ansdell, recited "The false light of Rosilly." The Rev. W. A. L. Taylor, who presided, gave a short address on "Discouragements." The host and hostess, who provided refreshments and cigarettes, were Mr. and Mrs. Herbert George. The social hour at the Parish Rooms was very well attended on Sunday evening, over 200 soldiers being present. Refreshments were provided at the interval. Songs were sung by the following: Mr Firth, "For you alone," and "Mother Machree ;" Gunner O’Niel, "Down the vale,' "The toilers," and "Thief ;" Miss Melbourne of Preston, "England," and "Somewhere voice is calling ;" and Mr. George Campbell "Rolling down to Rio," and "For till green." Miss Dickenson and Miss Baines were the accompanists. The concert at the Parish Rooms, on Wednesday evening was packed to the doors. The refreshments were generously provided by Mr. and Mrs. King and Mr. and Mrs Whittle. Songs were sung by Gunner Howarth, Gunner Wills, Miss May Baines and Mr. Firth; comic songs by Driver Thompson and Gunners Wright and Gildea; Miss Grundy and Lieut. Craig Cameron gave recitals which were highly appreciated. Then was a competition with ten entries, and the first prize was won by Gunner Mahone, a contortionist, who did some very clever items The second prize was divided between Gunners Howarth and O'Niel and Driver Robinson; and consolation prizes were won by Gunners Wills, Gildea, Allan and Thompson. The week-end concerts in St. George's Hall were again largely attended. On Saturday Mr. and Mrs. T. L. Milne generously defrayed the cost of refreshments and the Rev. G. Stanley Russell M.A., presided. The artistes ware Miss Rosie Heyle, Mist Lily Sutcliffe, Mr. Wright and Mr. Albert Heap, Miss Evelyn Cooper (of Fairhaven), and Miss Dorothy Dean, who gave an excellent sketch, "My Valentine." Gunner Malone and two other soldiers gave turns which were greatly appreciated. The accompanist was Mr. T. A. Clarke. On Sunday evening Mr. and Mrs. T. A. Riley were the host and hostess: and Mr. Riley presided. The artistes were Miss Jessie Clegg, Miss Gladys Riley, Miss Jessie Lord, Mr. A. Heap, Mr. J. Milne, Gunner Malone, Mr. T. A. Clarke and Mr. S. H. Clarke. The accompanists were Mr. S. H. Clarke, Mr. S. Clegg and Miss Riley. A brief address was given by the Rev. G. S. Russell. The host and hostess were heartily thanked for their hospitality. There is no sign of falling off in the popularity of the Y.M.C.A. at St. George's Hall, and the use of the room for reading, writing and recreation is as great as ever. Since the troops came to St. Annes over 16,000 letters and postcards have been written and posted in the V.M.C.A. rooms at St. George's Hall, and the Baptist Church lecture hall. The number of pledges taken is 926. With the number of troops along the coast steadily growing, this work of the Y.M.C.A. is increasing, and there are institutes at St. Annes, Lytham and Fleetwood. Mr. Lemuel jones, the local secretary, is seeking to secure premises, for the 169th Brigade at Blackpool, whilst the 165th, at Fleetwood (many of whom were in St. Annes), have now a cheerful gathering place in London Street, Fleetwood, where there are social hours on Sundays and "snickers" on Tuesdays. At Weeton, where 8,000 men are expected to encamp, arrangements have been made for the erection of a hut, which is being transferred from Morecambe. A very successful social hour for soldiers was held in the Baptist Lecture Hall, on Sunday evening. The Rev. P. B. Watson Cowie, M.A. presided, and Mr. Lemuel Jones, secretary for the. Y.M.C.A., gave an interesting address to the soldiers, on "The proclamation of pardon." Miss Gladys Brearley gave two recitals, and Miss Clegg sang two solos. There is some rare film footage of RFA Brigades at St.Annes and Lytham in the "Books" Section of this website, under "1915".